Virtual classroom tutoring can be a challenge that teachers are not prepared for. This makes it difficult to implement the innovative solutions and interactive opportunities the learners need. We offer you the results from a survey with data before and after a 2-hour training we conducted to future teachers in a virtual classroom. You’ll get statistical proof of the advantages such tutoring can supply you with. What is a synchronous virtual learning environment? Synchronous virtual learning happens in real time in a shared online environment such as chat rooms, video-conferences, etc., where the teacher and the learners can communicate and collaborate directly with one another. Some of its key advantages include: a high degree of interactivity, easy adaptation to the learning space, and the aspect of socialization. Virtual instructors (the tutors who deliver training in a virtual environment, when the instructor and learners are in separate locations) play the role of collaborative learning facilitators. Their ability to implement synchronous virtual teaching approaches is a key factor for effective classroom management. 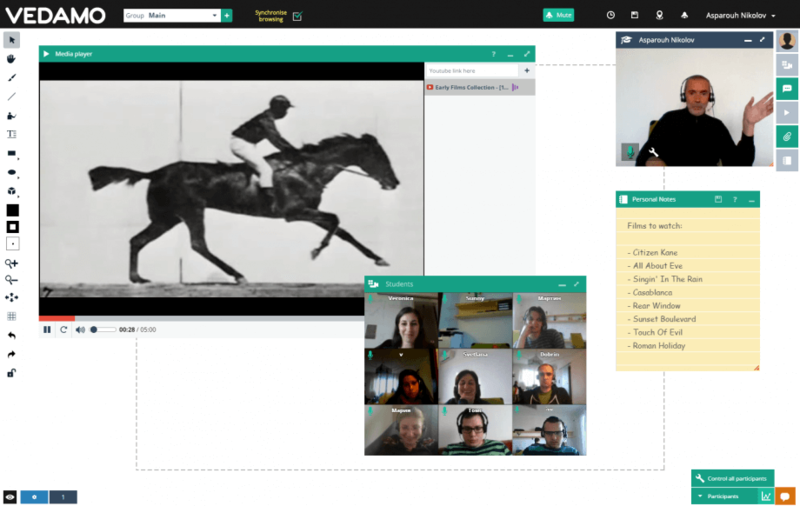 What competences should virtual instructors have? To provide a variety of media based on the different styles of learning, etc. How did we conduct our study? To explore the readiness of the future teachers for synchronous virtual instruction, we worked with 50 university students (who were in the 3rd year of their undergraduate studies) from the Faculty of Preschool and Primary School Pedagogy at the Sofia University. First, they participated in a 2-hour training introducing the pedagogical and technological capabilities of VEDAMO’s Virtual Classroom. Then, they had to choose a topic, plan, and conduct a short online session in VEDAMO. The university students were divided into groups of 5-6 participants. While one of them was conducting their virtual session, the others were playing the role of pupils. This gave the participants the opportunity to experience the virtual instruction from both sides – as teachers and as learners. Following the mock sessions, the future teachers filled out a survey about their confidence levels and preparedness to use synchronous virtual environments for educational purposes. To what extent did the future teachers feel prepared for virtual classroom instruction? During their mock virtual sessions, the participating university students demonstrated high levels of creativity and ability to engage their audience while implementing their virtual learning activities. The survey showed that the future teachers were able to quickly and intuitively grasp the use of VEDAMO’s Virtual Classroom; it also illustrated VEDAMO’s high potential for the realization of a variety of educational activities. After the practical experience with VEDAMO, we observed that the participants were motivated to work with synchronous virtual learning environments in the future. 48% of the participants had had prior experience with synchronous online tools that they had used mostly for personal communication (52% had not had any prior experience). 21% reported a high to very high level of awareness regarding the application of the synchronous virtual environments in educational settings before participating in VEDAMO’s training. 63% reported only a low or very low level of awareness. This shows that although half of the participants had been using synchronous online tools in their everyday life, many of them did not have enough knowledge on how to use these environments for educational purposes. 86% reported that the 2-hour training was enough to start using the virtual classroom in an educational context (14% needed additional training). 58% shared that they felt confident to work in a synchronous virtual environment after the training (32% were confident but needed more practice, while 10% did not feel confident). What is synchronous and asynchronous virtual learning? Dr. Veronica Racheva is managing VEDAMO’s training programme. Veronica is a PhD in Theory of Education. She graduated from the Doctoral School at the Institute of Education, University of London and has a specialisation for a Virtual Teacher from the University of California, Irvine. Currently, she is a CEO of a Bulgarian K12 online academy, based on VEDAMO e-learning infrastructure. She is also a lecturer in E-learning at the Sofia University, researcher and author of scientific reports.